Our desire to create 3D visualizations of data—for practical purposes, artistic expression or both—stretch back many millennia. Two experts in the field have created a stunning online archive of such physical artifacts from 5,500 BC to the present day, and beyond. Whereas words consist of immaterial sounds, the tokens were concrete, solid, tangible artifacts, which could be handled, arranged and rearranged at will. For instance, the tokens could be ordered in special columns according to types of merchandise, entries and expenditures; donors or recipients. The token system thus encouraged manipulating data by abstracting all possible variables […] No doubt patterning, the presentation of data in a particular configuration, was developed to highlight special items. Clay tokens suggest that physical objects were used to externalize information, support visual thinking and enhance cognition way before paper and writing were invented. A seismoscope is a qualitative indicator of seismic activity—as opposed to seismographs which show quantitative data, typically through line graphs. The oldest known seismoscope is Chinese and dates backs from 132. It was a large bronze device that dropped a ball into a bronze container (one of the eight frogs on the image above) every time an earthquake was detected, thus producing a loud sound. The direction of the earthquake could then be examined by looking at the container in which the ball was dropped. These three-dimensional maps were carved by Inuits from the Ammassalik Fjord in Greenland, and used as eyes-free guides for sailing. The left one shows coastline, the right one shows a sequence of offshore islands. These Inuit communities had had no direct contact with Europeans before a Danish explorer met them in 1885 and was shown the wooden maps. 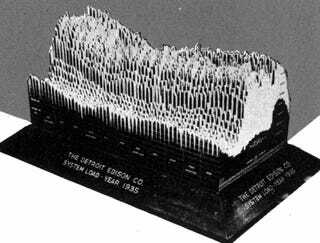 A large 3D physical visualization made by the Detroit Edison Company showing electricity consumption for the year 1935, with a slice per day and each day split into 30 minute intervals. It was likely used to better anticipate power demands. A 3D map of East London where elevation represents the rate of violent crimes between 2002 and 2003. A data sculpture by Luke Jerram that depicts nine minutes of seismographic readings during the 9.0 earthquake. At barely 1.5 centimeters across, each Cetonia scarab is a marvel of precision engineering. Designed from the ground up for agile flight, their integrated hydrogen chambers and a high-efficiency hover mode permit 15+ minutes of air time between charges. The hueSHIFT carapace is capable of displaying over 22 million possible colors and provides clear visual feedback in day or night with visibilities up to 1.5 kilometers. Integrated camera and sensor arrays permit full 6D reconstructions with composition profiling. From your wrist or a personal field station you can quickly deploy flights in automated formations to survey, measure, record, and manipulate almost anything. 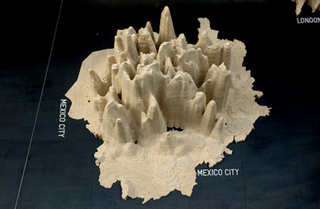 Visit the List of Physical Visualizations to see more data sculptures across the centuries.